Tesla just announced that the world’s largest battery installation is about halfway finished. The 100MW/129MWh utility-grade battery bank near the site of the 100MW Hornsdale Wind Farm in South Australia will be the largest system connected to an energy grid. 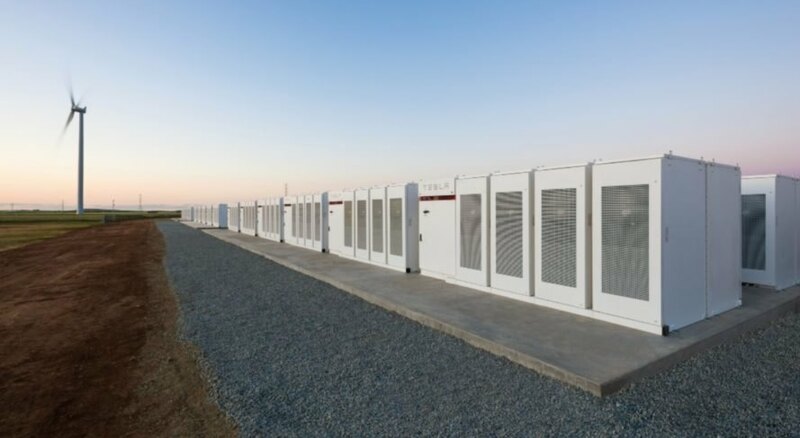 This massive undertaking was inspired by a bet between Tesla CEO Elon Musk and Australian software billionaire Mike Cannon-Brookes, who could not believe that Tesla was able to install its grid-tied battery systems as quickly as it claimed. Musk, confident in his company’s work, promised to install the world’s largest battery bank in 100 days or the State of South Australia would receive it for free. The clock is now ticking. After accepting the challenge, Tesla participated in a competitive bidding process to unlock a $115 million renewable energy fund from the State of South Australia, which has suffered disruptive blackouts in recent summer seasons. After estimating that the world’s largest battery bank would cost $32.35 million, excluding labor costs and taxes, Tesla was awarded the contract in partnership with the French company Neoen, which owns the Hornsdale Wind Farm on which the battery bank is being built. Musk made clear that the negotiation phase did not count towards the 100 days deadline. The stakes are high; if Tesla fails to complete its task within 100 days, it could suffer a loss of $50 million or more. Last Friday, Tesla officially announced the start of its 100-day challenge, though it would seem that the company gave itself a bit of a head start. The battery bank, which is being built at the Tesla/Panasonic Gigafactory in Sparks, Nevada, is nearly halfway complete as is the installation of batteries into the bank. “To have that [construction] done in two months … you can’t remodel your kitchen in that period of time,” said Musk at a kickoff event, seeming to acknowledge the absurdity of the situation. If any company is up to this kind of challenge, one based on a bet between billionaires, it’s Tesla. Tesla shines through the twilight near an array of battery banks and a wind turbine. An array of Tesla Powerpack battery banks in South Australia. Tesla just announced that the world's largest battery installation is about halfway finished. The 100MW/129MWh utility-grade battery bank near the site of the 100MW Hornsdale Wind Farm in South Australia will be the largest system connected to an energy grid. This massive undertaking was inspired by a bet between Tesla CEO Elon Musk and Australian software billionaire Mike Cannon-Brookes, who could not believe that Tesla was able to install its grid-tied battery systems as quickly as it claimed. Musk, confident in his company's work, promised to install the world's largest battery bank in 100 days or the State of South Australia would receive it for free. The clock is now ticking.